As a collectivity of responsible individuals, we certainly had been a tinpot society, as we could not arrange for a decent health care system for our poor population. 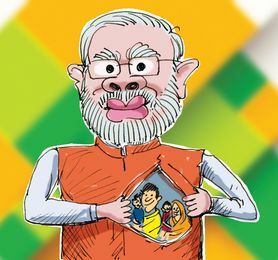 However, with the launch of the Ayushman Bharat Yojana, now renamed as the Pradhan Mantri Jan Arogya Yojana, we will be able to do away with the stigma once and for all. The NDA government has shown that with commitment and determination, things as big as PMJAY is possible because India, under the Modi government, cares for its poor citizens. The PMJAY, known better as ‘Modicare’ globally, is the world’s biggest health care scheme that aims to cover 500 million people, which is equal to the population of the US, Mexico and Canada together, or equal to the population of 28 members of the European Union. The Modicare scheme, inaugurated in Ranchi on September 23, and launched simultaneously in 476 districts across 26 states, is an excellent policy not only in its reach but also in the quality and comprehensiveness of care. The scheme aims to provide health insurance cover of 05 lakh per family per year for secondary and tertiary care, that is, for specialised and super-specialised category of diseases and procedures, which are most neglected as far the majority of poor people are concerned. There is no restriction on family size, age or gender and all members of eligible families, as present in the Socio-Economic Caste Census (SECC) database, are automatically covered. It means that no money needs to be paid by the poor family for specialised care, even in the best of private hospitals! Just walk into any of the empaneled hospitals and get the best of treatments for absolutely no cost. The best part of the policy is that all pre-existing diseases are covered from day one of the policy, that includes pre- and post-hospitalisation. The BJP had always felt that India needed a holistic health care system that would be universally accessible, affordable and effective and that could drastically reduce the out-of-pocket spending on health. As widely perceived, the National Rural Health Mission system, based on Primary Health Centres (PHC) in rural areas, had failed to meet the designed objectives. Moreover, the current policy focussed largely on reproductive, maternal, newborn, child and adolescent health, apart from certain communicable diseases, whereas the major chunk of death came from the non-communicable variety of diseases that account for nearly 62 per cent of deaths among men and 52 per cent among women. The BJP accorded high priority to the health sector, and accordingly we had promised an overarching health assurance to all Indians and to reduce the out-of-pocket spending on health care, in our electoral manifesto of 2014. Hence, inaugurating the scheme was a “tryst with the promise” moment for PM Modi. Let people speak up against such indifferent politicians with their ballots.